People who are not yet registered to vote are being urged to sign up if they want to vote in May’s elections. All seats at Bicester Town Council and four Bicester seats on Cherwell District Council are up for election on Thursday, May 2. In order to vote, residents must be registered on the electoral register, which it the complete list of those allowed to vote at election time. The closing date to register is midnight on Friday, April 12. Chief Officer Samantha Shippen said: “It is vitally important that you are on the electoral register if you want to vote in May’s local elections. Anyone interested in standing as a candidate must submit nomination papers, in person, at Cherwell District Council’s office, in Bodicote, Banbury, between Wednesday, March 27, to Wednesday, April 3, week days only, between 10am and 4pm. The final date for people to hand in a nomination form is April 3, at 4pm. This year Bicester Town Council’s boundaries have changed. The former five wards have been split into four wards, now known as Bicester East, Bicester South, Bicester North and Bicester West and there are a total of 15 seats. All 15 seats are up for election and prospective councillors can submit nomination papers to Cherwell District Council from Wednesday, March 27, to Wednesday, April 3, week days only, between 10am and 4pm. This year the town council’s boundaries have changed. The former five wards have been split into four wards, now known as Bicester East, Bicester South, Bicester North and Bicester West. Elections are held every four years and in order to stand people must be aged 18 or over, a British or European citizen, or eligible Commonwealth citizen, and live or work in the local area. Town councillors look after a budget of over a million pounds and influence decisions about issues including open spaces, allotments, the cemetery and events in Bicester. Chief Officer Samantha Shippen said: “The first stage of the election process will commence on Tuesday 26th March 2019, when Cherwell District Council, the body responsible for elections, will publish the notice of election. “The notice will be placed on the Bicester Town Council website and noticeboard. Nomination papers must be delivered by hand to the Cherwell council’s offices at Bodicote House, Bodicote, Banbury, OX15 4AA. People can also call ahead to make an appointment on 01295 221534. A full list of candidates for each ward will be published as soon as possible after nominations close. Elections will take place on Thursday, May 2. BICESTER Town Council has signed off its budget for the next year with improvements to outdoor spaces top of the agenda. During the new financial year, 2019/2020, the council will continue to invest in play areas and open space around the town, as well as support local services. Plans for 2019 include at £30,000 makeover for Sunderland Drive park, which will get a zip wire, continuing financial support for the Citizens Advice Bureau and Shop Mobility scheme. 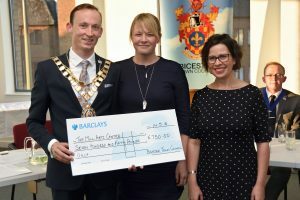 Organisations and charities across the town will get a financial boost in May when grants totalling £18,500 will be handed out. Councillors have also agreed to maintain the 2018 fees for football pitches, allotments and cemetery charges. In order to make the plans a reality, the town council’s share of the council tax will rise by 1.98% making an increase for a band D property £2.46 for the year– less than the price of a cup of coffee. Council leader Richard Mould said: “We are excited to continue our investment in Bicester’s outdoor spaces which benefit all residents. “Last year we made improvements to eight parks as part of a five-year initiative to update facilities. We collaborated with partners including Sport England and Cherwell District Council to finance the complete rebuild the skate park in Garth Park which provides a fantastic facility for young people. Precept definition: Parish and town councils have the right to raise money from their parishioners via the Council Tax process. They do this by ‘precepting’ on the principal council (Cherwell District Council) who levy on tax payers in that parish or town as part of the Council Tax billing. A local police officer who led a project to build a brand new £150,000 skate park in Bicester has opened the gates to its first users. PC Vicky Lees welcomed a crowd of young people to Garth Park, in Launton Road, to finally try out the new facility after it was closed in October for a complete rebuild. Three-years-ago a new skate park was just a pipe dream, but thanks to funding from Bicester Town Council, Cherwell District Council through developer contributions, Sport England, and fund raising by skate park users, it has become a reality. Specialist skatepark firm Freestyle designed and built the new park in collaboration with the young people who use the facility. And last week after town council took possession of the new facility it was quickly opened for skate fans to use ahead of an official unveiling later this year. PC Vicky Lees said: “I have received awesome feedback from the community, particularly the young people and this means everything to me. All the hard-work has paid off. 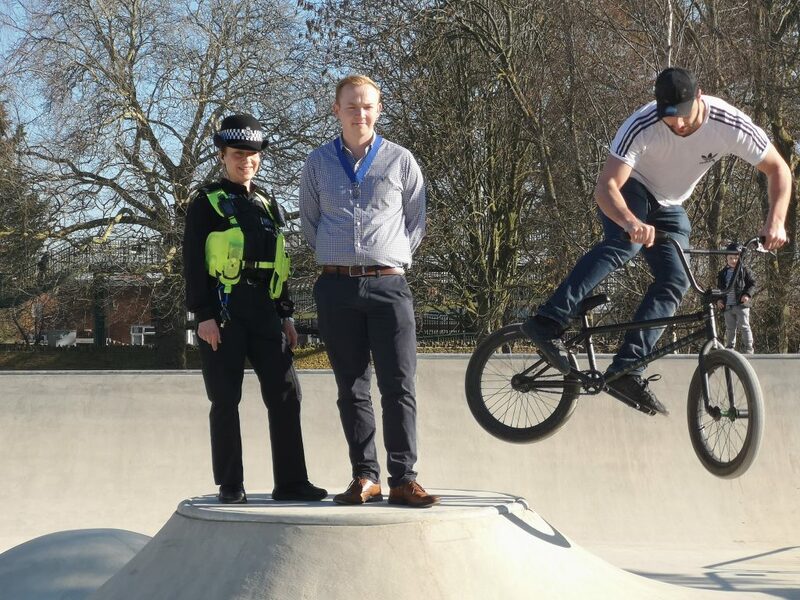 PC Lees got involved in 2015 after reports of anti-social behaviour in the town centre, which included BMX riders and skateboarders riding in Pioneer Square. They told her they wanted a modern skate park – the current one was in a poor state of repair – so she encouraged them to lobby councillors to back an initiative to replace the skate park. Deputy mayor Jason Slaymaker, who has also been involved with the project since the beginning, said: “The skate park has been completely transformed and is fit for a new generation. “The town council has really enjoyed working with PC Lees, the young people and our other partners to get this project off the ground. “This project has been a real community effort – the young people involved are a credit to the town. 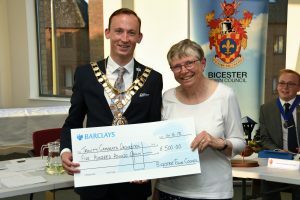 Bicester Town council has launched its annual awards scheme to recognise the great and good of the community. Nominations have now opened and residents are invited to put forward the name of someone they feel has gone above and beyond to enhance the lives of townspeople and make Bicester a better place. The annual Good Citizen Awards, run by the town council, is open to anyone and winners will be presented with a Good Citizen badge and certificate by the Mayor at the annual mayor making ceremony in May. 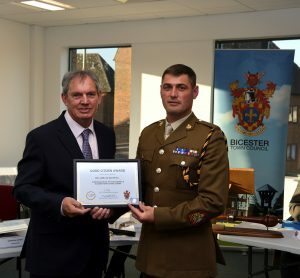 Last year’s winners included Bicester Garrison Sergeant Major WO1 Lee Davies for his work to bring the local community and the garrison together, and the mayor’s cadet for 2018 Carmen Simpson. Bicester Town Council leader Richard Mould said: “Everyone knows someone in the community who stands as making a real difference. “Over the years we have had a wide range of winners from Scout leaders to the foodbank founder. “The Good Citizen Award is a way of thanking those people across our community who really go that extra mile. The Good Citizen Award scheme was launched in 2001 as a way of recognising people who had made a positive impact on their community and thank them for their hard work. Other former winners include Bicester Foodbank founder Janet Ray, Kirsty Lowe in recognition of her commitment to Langford Village Community Association, Group Scout Leaders Jill Edwards and Ellie Thompson, Mary Daniels for 20 years’ work with Bicester Talking Newspaper, and Assisted Reading for Children volunteer Jenny Stockley. The closing date for nominations is March 8. A permanent vacancy within our Administration Team based at Garth Park in Bicester. Working Monday to Friday, within our small administration team, your focus will be finance and the democratic administration. Closing Date: Friday 4 January 2019. Interview Date: Monday 14 January 2019. 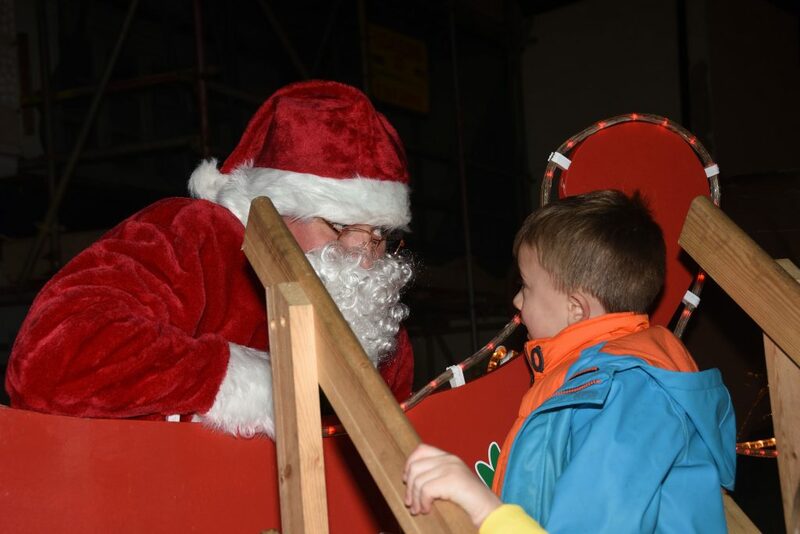 BICESTER was full of festive cheer as the town came together to mark the launch of Christmas. Thousands of people came into the town throughout the day and helped make the event a great success. 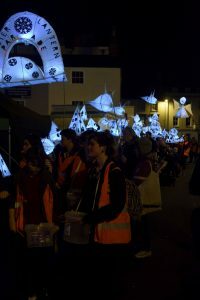 One of the highlights was the lantern making and parade event, which was organised by OYAP, and involved scores of children holding their dazzling lanterns, and walking from the Methodist Church around the town centre and finishing in Market Square. The mayor then had the “difficult” job of choosing the three best lanterns, and their creators were then invited onto stage to help turn on the town’s Christmas lights. 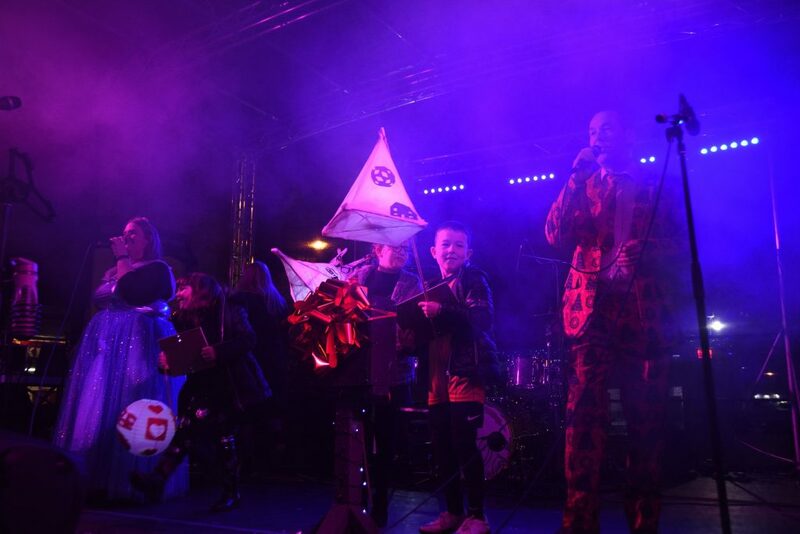 The winners were Aisling, Martha and Billy Ray who, as part of their prize, helped the Mayor, Cllr Sean Gaul, press the all-important switch to light up the town ready for the festive season. Organised by Bicester Town Council, the annual event took place on a Saturday for the first time. 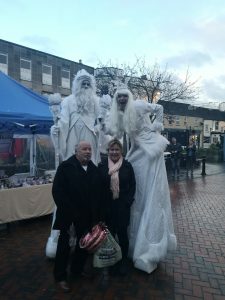 Throughout the day, which coincided with Small Business Saturday, there was a host activities and entertainment, such as traditional toddler fair rides, Huskies, and street entertainers including roller-skating baubles, cheeky elves and the Snow King and Queen. OneBicester organised a Christmas market with stalls selling arts and crafts, gifts and traditional festive refreshments. The Market Square hosted the main stage and there were performances from a host of local groups including Bicester Rock choir, local bands Bangtail Feathers and Rhythm Street and students from Adele Peters Performing Arts School who performed on stage and took part in a ‘flash-mob’ dance outside Sainsbury’s in Pioneer Square. Entertainment was also provided by drummers and a fire entertainer in the centre of Market Square and of course a visit from Father Christmas. The event culminated with the switch on from to the stage with an accompanying light show.